Bring personal items, like pictures, quilts/blankets, clocks, calendars & decorative items to make the space feel like home. Check with the nursing home to find out what is allowed. Any items you bring should be labeled with the patient's name. Make sure glasses, hearing aids and dentures as well as their containers are labeled with the patient's name. Extra furniture and clothing. While these items go a long way for the comfort of your loved one, space in a nursing home is limited. Consult with the nursing home before you bring these items. Bladder control products. Products like Depends are a must-have if your loved one has loss of bladder or bowel control. 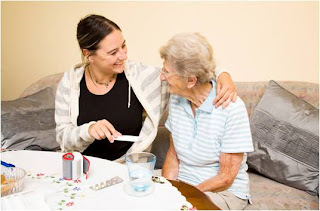 Nursing homes generally supply cloth products but these can be less effective and require more clothing changes. Have magazine and newspaper subscriptions forwarded to the nursing home. Check with the nursing home to find out what radio and TV sizes are appropriate or if these items are already provided. If you do bring them, make sure they are labeled with the patient's name. Phone and cable services. Consider whether the resident would benefit from having their own service and ask how they are arranged within the nursing home.